Intense efforts are underway to discover and utilize the potential in plants before their genetic resources are lost to extinction. 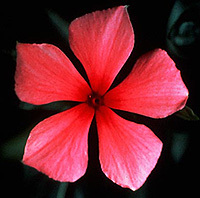 The rosy periwinkle, Catharanthus roseus from Madagascar, is the source of vincristine, a drug that has improved the odds of surviving childhood leukemia from one in twenty to nineteen in twenty. From our earliest beginnings, humans have been on an unending quest to discover the useful properties of plants. The search has produced a healing harvest. Plants are the source of powerful therapeutic drugs for treatment of cancer, hypertension, Parkinson's disease, and many other illnesses. Today, three out of four people in the developing world continue to rely on remedies made directly from plants. Where prescription drugs are the norm, a majority of medicines contain at least one plant-derived compound.